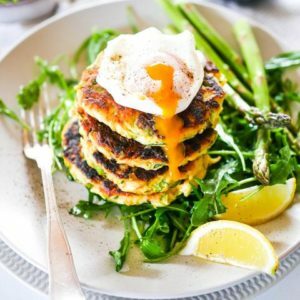 This fritter recipe uses asparagus which are just in season now. These fritters can be served for any meal from breakfast, to brunch to lunch or dinner. They are a complete meal and marry well with the addition of a poached egg or a refreshing dipping sauce and a seasonal salad. They are high in protein, low in carbs and packed with seasonal vegetables. You can also adapt the recipe to other seasonal vegetables like courgettes, cauliflower and many others. Prepare the Yogurt Cucumber Sauce by blending all of the ingredients together with a blender or food processor. Adjust seasoning to taste and refrigerate until ready to use. Prepare the Tahini Lemon Sauce by mixing the tahini with olive oil until smooth, then slowly adding in lemon juice and water until it becomes a very smooth fluid sauce. Add the remaining ingredients to taste and set aside. Steam the asparagus until bright green and just tender, about 3 minutes. Chop finely and transfer to the center of a dish towel. Squeeze out as much water as possible from the asparagus. Transfer to a medium sized bowl. Add the eggs, scallions, garlic, herbs, flour and cheese (if desired) and combine well. Season with salt and pepper. Add more or less flour depending on the consistency of the mixture which should be wet but maintain its shape. In a cast-iron skillet or steel pan, heat about 1 cm oil over a medium heat. Test the temperature of the oil by dropping a bit of the batter – if it sizzles quickly, the oil is hot enough but it should not smoke. Drop the batter into the skillet making them into small round fritters about 2-3cm high and 6cm in diameter. Only put in a few at a time so they don’t become crowded. Cook the fritters over medium heat until the edges underneath are a golden brown, about 3 to 4 minutes. Flip the fritters and fry them on the other side until browned underneath again, about 2 to 3 minutes more. Drain briefly on paper towels then transfer to baking sheet and into a warm oven (about 140 C) until needed. Repeat process, keeping the pan well-oiled, with remaining batter. I prefer finishing the fritters off in the oven for 5-10 minutes to finish setting and ensuring the inside is cooked through. To serve, you can add a poached or fried egg on top, and a mixed green salad ont he side. Serve with your dipping sauce of choice.